According to Egyptian alchemists, the symbol of half-sun half-moon was applied to two states of existence held together within one body, the brilliant light and the mysterious dark. The wedding of opposites also represents the desire to awaken and break free from the lonely sleep of the conscious mind and become whole. Therefore, we must navigate the passage between the separate halves of our own being to move through the void towards the Godhead. The engagement is brief. 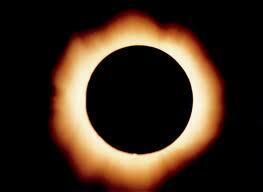 In an instant totality is upon us and the day puts on a cloak of darkness. Then the corona surrounding the sun bursts into view—a pearly white delicate light spreading out behind the blackened moon. Nature and time meld together coming into quiet repose. Red solar prominences, arching flame-like eruptions, rise from the surface of the sun punctuating the inner corona. For a few more minutes the delicate corona, the halo of our sun, shows its glory. We catch our breath in the quiet beauty of connection with divinity. This is the moment of opportunity to realize and touch the magnificence of God’s universe with unexpected intimacy. 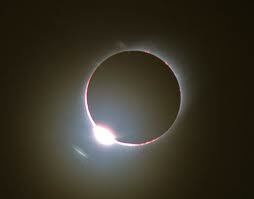 Eclipse comes from the Greek word meaning abandonment However, the sun’s abandonment of the sky is a temporary illusion. When we glimpse our soul in this moment of abandonment, we can choose to stay in the void of fear or see the illusion and look to the corona and know that the light is always there. The moment of totality passes and movement commences. The shadow releases the sunlight and the warm rays touch our faces once more. Breathing resumes. Anxiety is replaced by inner calm and relief. We are never abandoned by God, either during movement or in rest. The eclipse reminds us that our faith and trust are not misplaced.